Meet your neighbor Todd Wetterling. Todd grew up on a farm between Raritan and Stronghurst, in rural Henderson County. He graduated from Southern High School, Stronghurst, in 1988 and Monmouth College in 1992. Todd is currently employed by the Monmouth-Roseville School District as a 7th grade Health teacher. 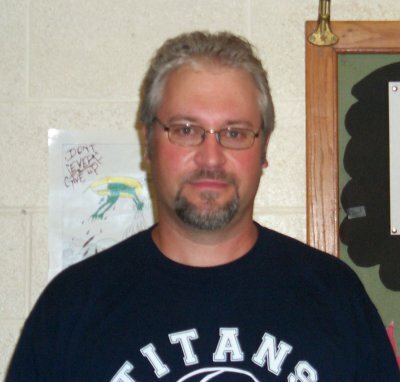 In addition he coaches the 8th grade girls basketball team and the boys Jr. High track teams. He formerly taught and coached at his old stomping grounds at Southern schools. He now lives in Monmouth with his wife, Vanessa, and his two dogs, Guinevere and Cowboy. His parents are John and Rose Wetterling of Stronghurst. They are both employed by West Central School District, John in maintenance and Rose as an elementary teacher. He has a brother Scott who lives in La Harpe with his wife Diane and family. In his spare time Todd enjoys golfing, gardening, cooking, coaching and especially now, watching the Chicago Cubs be in first place.